The papal nuncio to Ireland, Archbishop Charles Brown, is due to take part in the Irish Chaplaincy in Britain’s fundraising walk along a famous famine route in Co Mayo later this month. The walk is part of the Church’s ‘Year of Faith’ celebrations and this year’s theme is ‘In the Footsteps of Irish Emigrants’. The event also serves as a fundraiser for the Chaplaincy which works with more than 1,000 vulnerable Irish people across its Irish Seniors, Irish Travellers and Irish Prisoners projects. 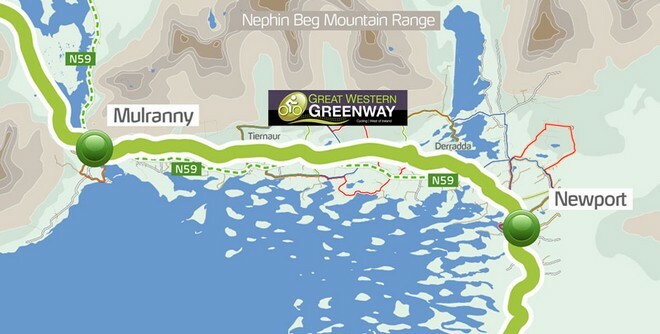 Participants will walk 18km along the historic Great Western Greenway route between Mulranny and Newport in Co Mayo on 17 August, but there is also an option to undertake shorter 6km or 9km routes around Mulranny loop instead of the full trek. In 2011, the ‘Green Way’ route from Newport to to Mulranny along a disused railway line was reopened. It follows a path many Irish emigrants were forced to take as they prepared to emigrate from the West of Ireland due to their economic circumstances. The walk will be sponsored by the Irish Construction Workers Benevolent Fund, which means all the money raised through individual sponsorships and donations will go directly to supporting the Chaplaincy’s work. Irish Chaplaincy spokesman and Co Down native, Fr Gerry McFlynn, said the combination of shorter and longer walks makes the event doable for everyone. “Hopefully these options will give people the opportunity to relax and enjoy the fresh air, company, sunshine and some prayers”, he said. He appealed to anyone interested in participating in the walk to contact the Chaplaincy via its website at http://www.irishchaplaincy.org.uk/ or email: admin@irishchaplaincy.org.uk or Tel: 0044 207482 5528. According to Conn Mac Gabhann of the London-based Chaplaincy, the Irish in Britain still face casual discrimination. “You only have to look at the comments by the Deputy Mayor of London about Irish builders or the Chairman of Essex County Council speaking about ‘Irish criminals.’ It’s still acceptable in some quarters,” he said. Speaking to Independent Catholic News, Conn Mac Gabhann, who is originally from Omagh, said the number of young Irish people coming to London over the past couple of years has increased hugely. He explained that demand for the Chaplaincy’s services through its three projects – the Seniors Project, the Prisoners Project and the Traveller Project – “has never been higher”.